So you've got a neat idea or loop going - but how do you extend it into a full section without it getting boring? In dance music in particular, focussing on one solid concept can often be more effective than writing multiple contrasting sections. Here, then, are our top ten tips for making your best ideas longer and stronger. It might sound obvious, but the most foolproof way to ensure you'll be able to develop and progress an arrangement is by creating your track elements with this in mind from the start. For example, when programming a synth or bass part at the initial loop stage, have a play with the instrument's parameters while bearing in mind how these tweaks can be incorporated into an arrangement. Perhaps dramatically opening the filter cutoff at the end of eight bars will provide a much-needed change, or reducing a bass synth's filter envelope amount will pull down the part's 'twang' and cool things down mid-track. If you're using a synth with macros, such as Massive or Serum, then you can go one further and prepare custom knob assignments designed to develop a part throughout the course of a track. Another way to develop the same idea over time is to record and prepare more material than you need, with the foresight that you'll be able to return to any unused sounds or variations later and use them to develop the track further. This is far easier when your compositional workflow incorporates bouncing or rendering parts to audio - for example, many producers record synth parts onto an audio track in real time, continuously tweaking knobs in the search for a 'magic moment' or loop that will form the centrepiece of a track. Provided you've generated enough usable material, this will leave you with a bunch of variations within each audio region that you can extract and incorporate in an arrangement for extra movement and change, or the occasional fill. Ah, the good old reverse effect: a staple of dance music since the days of rave and jungle. It's one of the most basic effects to execute, yet it can have a monstrous impact on a dancefloor, injecting a new lease of life into a static track. Take a sound from your arrangement, bounce it to audio, then use your DAW's audio processing to play this bounced file backwards instead of the original part. It's a versatile trick - anything that isn't a static, sustained sound will likely sound good played backwards, from a beat to a bar or two. Your core drum groove is an obvious candidate for the reversal, but also try reversing synth stabs, basses, or even entire sections of a track to introduce some variation. An energetic way to switch up an existing section of a track is with rhythmic variation. This can take a near-infinite number of forms: examples include the introduction of a new percussion part such as a ride cymbal or bongo, or simple variations in the drum pattern itself, such as staggering the second snare of a bar back by a half-beat or so. If you're too lazy to head in and reprogram your parts, there are a heap of ways to step up the rhythm with a couple of mouse clicks - two of our favourite tricks are mixing in tempo-synced delay on a hi-hat sound to fill in gaps and add extra groove, and throwing a beat repeat/stutter plugin on the whole drum bus to change the entire groove. While filtered French house isn't everyone's cup of tea, you can take a lot of inspiration from the Gallic 4/4 style when arranging a track in any genre. Simply group your core musical elements to a single bus, insert a low-pass filter plugin on this bus, then pull down the cutoff at points when you want to 'cool down' the arrangement. This basic technique can be used in plenty of ways: slowly open the filter to introduce your musical elements as the track develops, sweep the cutoff down later in the arrangement once your ear gets tired of the main hook, or wildly filter parts at unexpected points to keep the listener guessing. Old funk and soul records would often strip all the vocal and melodic elements back mid-track, allowing the drummer to let loose in isolation. These funk-fuelled 'breaks' have long been used as sampling fodder by electronic musicians, but forget shameless sampling: instead, take inspiration from the original concept and alleviate aural boredom by giving your listener a well-needed rest mid-track, reducing the current elements down to only drums and bass for a while. Often, you'll be happy with your current chords and/or riffs, but the actual sounds used might begin to grate on your ears. For a quick 'n' easy variation, simply duplicate a key MIDI region over to another channel and hook up a new synth or instrument. How you use this new element is up to you: either mute the original part and introduce this new sound as an abrupt tonal switch, or keep it subtle and blend the new layer behind the other. 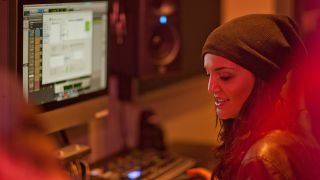 If a track is getting monotonous, it can be tempting to give in and switch to a more exciting, complex musical idea. Don't do it! Instead, drop out a few parts and transition into a 'mini-breakdown' designed purely to refresh the ears and break up the flow of - and ultimately enhance - the original loop when it returns. For maximum results on the dancefloor, keep this 'cool-down' section rolling for 4, 8 or 16 bars, then build up the tension and drop back into the original idea - perhaps with one or two new changes or sounds thrown in to surprise the listener. It may be a cliché heard in a thousand tracks, but give this quick and dirty method a try: once a basic chord sequence has outstayed its welcome within an arrangement, copy the MIDI to another synth instance and arpeggiate the chords to create a synth sequence that supports and rides over the original chords, lifting the interest of the track without having to write a new accompanying part from scratch. Keep these notes simple and quiet in the mix to provide subtle lift and momentum; or go all out and drop in a huge, extravagant synth arpeggio to abruptly ramp up the cheese factor. There are plenty of standard 'incidental markers' that can be used to keep the momentum up in a track - things like a crash cymbal marking an 8- or 16-bar section, a drum fill at the end of 16 bars and before a new section, chopping out regions to create short gaps in the arrangement, and so on. Many of these have become overused throughout pop and electronica, but their popularity continues for a simple reason: they allow a steady idea to roll along for longer, marking out time in an arrangement and adding fool-proof thrills without having to introduce brand new musical elements. Put your own stamp on clichéd techniques like these by swapping them out for atypical but functionally similar sounds, or by adding them in unexpected (but musically logical!) places, subverting the listener's expectations and helping you create a unique artistic style. Stuck in a loop? Check out Computer Music issue 229 for ways to turn your musical ideas into amazing full songs today! Plus: FREE Transient Shaper - 59 VST/AU plugins - 900 Cinematic Drama Samples.